The Trump administration’s disaster response in Puerto Rico after Hurricane Maria has been weak. The administration’s feeble response to Hurricane Maria rivals Bush’s after Katrina. 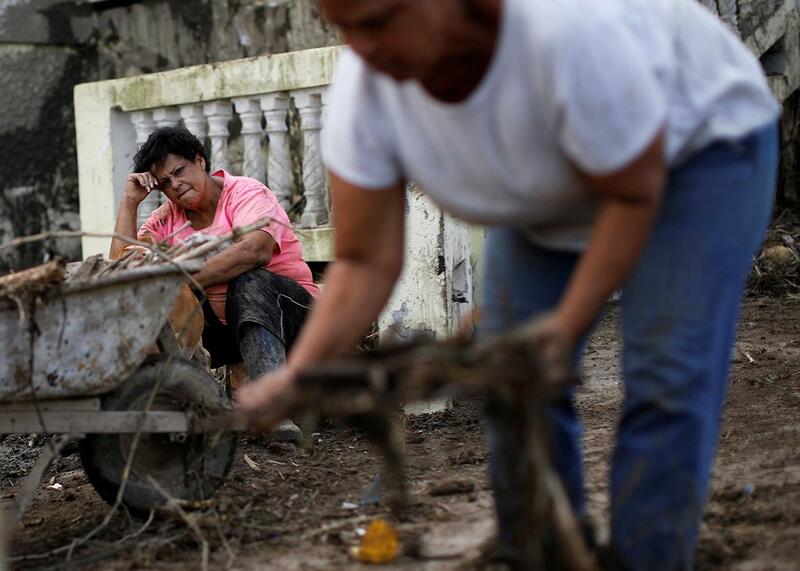 Carmen Marrero takes a rest while she cleans debris from her house after the area was hit by Hurricane Maria in Toa Baja, Puerto Rico. When it struck the U.S. Virgin Islands and Puerto Rico six days ago, Hurricane Maria was the strongest storm to hit the American territories in 80 years. “Its force and fury stripped every tree of not just the leaves, but also the bark, leaving a rich agricultural region looking like the result of a postapocalyptic drought,” according to one New York Times dispatch from Puerto Rico. In its wake, more than 3 million Americans now live without electricity or adequate food or water, and under the specter of looting and disorder. Some 80 percent of island’s agriculture has been destroyed, decimating a source of food as well as a chunk of Puerto Rico’s economy. Ninety-five percent of cellphone towers on Puerto Rico are out, depriving locals of a way to ask for help—and crippling any government response, too. The situation will likely worsen as emergency supplies run out and as the local government finds itself unable to deliver support or maintain order across such a wrecked landscape. So far, the Trump administration has dispatched an anemic Federal Emergency Management Agency mission and sundry military units to assess the situation and provide support. But in some cases it took the federal government days to even contact local leaders in Puerto Rico’s major cities, let alone deploy aid. Only the most rudimentary military support is now on the ground. This is inadequate and calls to mind the lethargic response by the Bush administration to Hurricane Katrina in 2005. The U.S. military has a unique expeditionary capability to deliver humanitarian support, logistics, and security anywhere in the world, far above what FEMA or any other civilian agency can muster. American citizens are suffering and dying and need all their government can do for them (including the military). Unfortunately, their president and the military at his command appear focused elsewhere. Unless this changes, more Americans will die. Local officials told CNN that 4,000 Army reservists were at work on the island already—although that figure doesn’t match official reporting coming out of the Pentagon or FEMA. (It may, predominantly, include the members of the Puerto Rico National Guard, which includes roughly 8,400 Air and Army National Guard troops.) Within hours of the storm passing, FEMA opened an “air bridge” using military aircraft to bring support personnel and critical equipment to Puerto Rico. FEMA has since brought in more troops, including parts of an Army electrical power unit. Northern Command, the Pentagon headquarters responsible for this operation, said Thursday it was using a handful of aircraft to conduct recovery operations, adding an Army medical company of roughly 150 troops and the USS Kearsarge and USS Oak Hill amphibious ships (with Marines on board) to the operation over the weekend. All told, this force package appears to comprise roughly 10,000 troops, focused primarily on medical evacuation and delivery of supplies. In the five days since the storm, FEMA says it has distributed more than 1.5 million meals and 1.1 million liters of water to Americans affected by the storms, with more staged for future deliveries. Make no mistake: These troops have already saved lives and will save more in the weeks to come. Delivering 1.1 million liters of water is no small task. But Puerto Rico has 3.4 million residents, and another 100,000 live in the U.S. Virgin Islands. Clean water is a basic daily necessity. These islands’ residents will need orders of magnitude more—plus food, fuel, electricity, housing, medicine, and more—in the months to come until local capacity is restored. Here’s one more complicating factor: Unlike other disasters where local authorities retain some capacity, or at least the ability to request mutual aid from adjacent communities or states, the island governments of Puerto Rico and the U.S. Virgin Islands are completely crippled, and they have no neighbors to call upon for help in the way that Los Angeles could after a major earthquake. Likewise, where FEMA might ordinarily purchase goods or services to provide support, or deploy it from adjacent places, it cannot do so here. The scope and scale of Hurricane Maria’s destruction deserves a more robust (and immediate) response containing certain key types of units. Army engineers should deploy to help remove debris, reopen roads, assess and repair canals or dams, restore power, and build temporary housing. While local hospitals and clinics re-establish themselves, mobile military clinics should take their place alongside military experts in public health and sanitation who can ensure epidemics don’t claim those lives the storm passed over. Military logistics units are singularly equipped to deploy anywhere to support U.S. forces with water, electricity, food, communications, and tent housing, and they can provide this support to civilians in the Caribbean too. Military police—including those from the Army National Guard who have specific training for a domestic response like this—should deploy to help maintain order and security until local law enforcement can reassume this role. An armada of air and naval forces should support these ground troops, providing an unbroken chain of support that can deliver millions of pounds of supplies, week after week, for as long as necessary. Given the size of Puerto Rico and the U.S. Virgin Islands, and the scale of devastation, it may take a task force of 50,000 service members to fully meet the needs of Americans suffering after Maria’s passage. The massive U.S. military has the theoretical capability to do all of this—but doing so would require political will, and require enormous bureaucratic and fiscal resources, to execute. Unfortunately for the Americans struck by Maria, neither that political will nor fiscal generosity currently exists in Washington. For its part, the U.S. military has been running hard abroad and at home, shouldering the burden of two regional wars in Iraq and Afghanistan, stepped up tension in the Pacific, and a steady drumbeat of deployments around the world. For deep cultural and structural reasons, today’s Pentagon focuses on its overseas missions like Afghanistan far more than on domestic disaster response, even when American lives are more immediately threatened by emergencies at home. To the extent that certain Pentagon elements (like the National Guard or U.S. Northern Command) are focused on domestic response, they are running out of gas. The rapid-fire succession of storms—Harvey in Texas, Irma in Florida, and now Maria in the Caribbean—has drawn heavily on the narrow slice of the Pentagon focused on that role. Given all these commitments, and the military’s focus on overseas missions, it might take something huge—like a presidential call-up involving tens of thousands of reservists, or presidential adjustment to the Afghanistan deployment schedule—to create the military capacity that Puerto Rico and the U.S. Virgin Islands need now. Such a call-up would require additional resources, too—something Congress would almost surely give. But the White House has signaled it would not even request that funding until sometime in October. Such a presidential order should have come before the storm, or immediately afterward. Unfortunately, President Trump appears more concerned with helping his political allies, taunting professional athletes, and issuing new travel bans. Although his White House issued pro forma disaster declarations, and authorized some additional funding, its focus has clearly been elsewhere. In the absence of presidential leadership and orders, military commanders cannot (and should not) deploy additional forces or commit additional resources to help. Meanwhile, the situation on the ground remains dire, with hospitals and critical infrastructure running on their last days of generator power and supplies, waiting on the White House to send more support their way. The unique political situation of Puerto Rico and the U.S. Virgin Islands does not help here. Although these islands’ residents are American citizens, they have no voting representation in Congress, nor a powerful lobby in Washington. Indeed, their voices arguably carry less weight than a comparably sized city or special interest group. On top of this structural disempowerment, the political leadership of Puerto Rico and the U.S. Virgin Islands literally had no ability to communicate for the past several days. This too has hindered the federal response, to the extent that FEMA and the military typically defer to local authorities before moving in. However, it is also impossible to ignore darker, more cynical reasons for the delay, just as it was impossible to ignore these reasons during the Bush administration’s sluggish response to Hurricane Katrina. When Hurricanes Harvey and Irma hit Texas and Florida, respectively, tens of thousands of troops, first responders, and government officials snapped into immediate action, with direct attention by the president and his top aides. When Hurricane Maria hits two offshore American territories, the response pales in comparison. Meanwhile, Trump mentions professional athletes more than 12 times while saying nothing about Puerto Rico or the U.S. Virgin Islands. This is unconscionable. Americans in peril deserve our support, no matter who they are or where they live. The situation for 3.5 million Americans in Puerto Rico and the U.S. Virgin Islands grows more precarious by the day. These Americans can no longer wait for a response slowed by bureaucratic lethargy and political indifference. To paraphrase the military proverb: The best time for action was yesterday; the second-best time is now. President Trump must focus attention on this disaster and deploy appropriate military resources, immediately, or else bear the responsibility for deaths and suffering that could have been prevented.